This is the Happiest Blanket Ever! Or at least the happiest blanket I’ve ever made. It was fun to make, and puts a smile on my face every time I look at it – I hope it does the same for you! 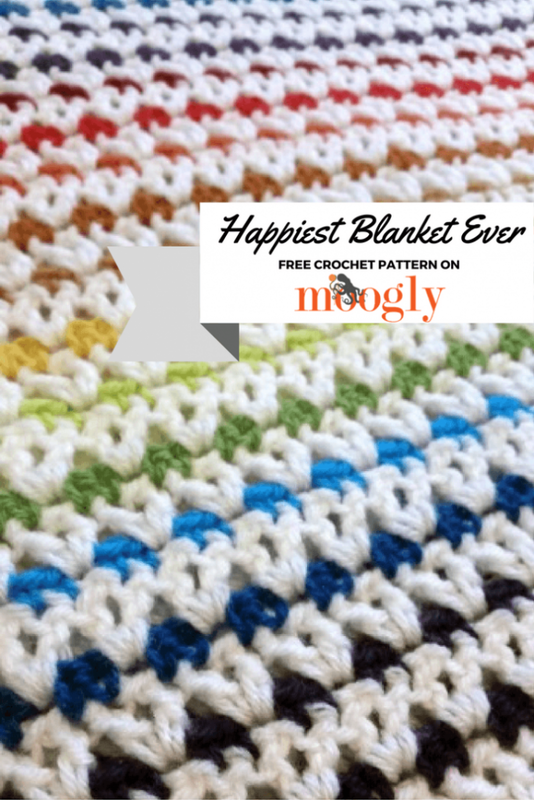 The Happiest Blanket Ever is great in any size – and there’s a chart with all the sizes below. 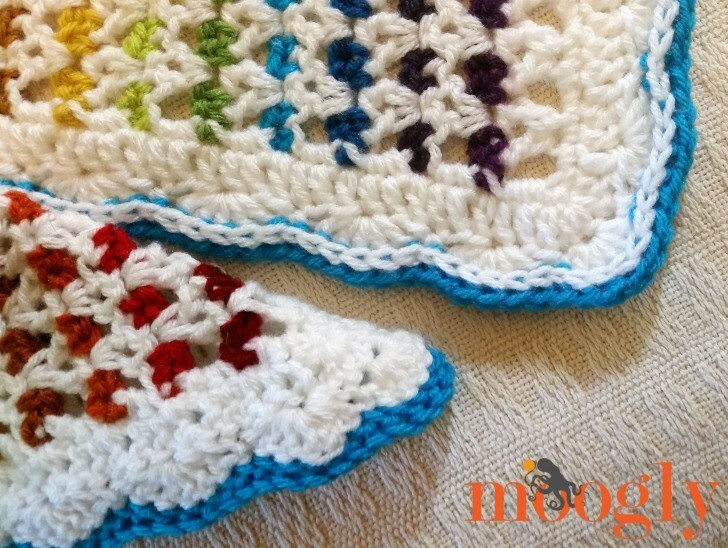 You can go with just 2 colors, or the rainbow riot of colors shown here – it’s a great stashbuster! 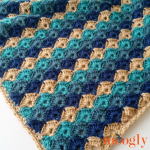 And with its easy 2 row repeat can relax you as you crochet. And the border will have you on cloud nine! Row 1: With Main Color, ch for size as indicated in chart above, skip 1st 4 ch (counts as dc and skip 1 st), *V st in next ch, skip 2 chs; repeat from * to end, dc in last ch finishing st with Color A, turn. Row 2: Ch 1, sc in 1st 2 sts, *ch 1, skip ch-1 sp, sc in next 2 sts; repeat from * to end, break yarn, do NOT turn. Row 3: Insert hook in 1st st made in Row 2, yarn over with Main Color, ch 3 (counts as dc), V st in each ch-1 sp across, dc in last st finishing with next Color; turn. Repeat Rows 2 and 3, cycling through Colors, ending with a Row 3 repeat (see chart above for Row count). Round 1: With Main Color, sc evenly around blanket, working 3 sc in each corner. When crocheting along the side edges, ch 1 over the accent colored rows, and work 2 sc in the side of the Main Color Rows; join. Round 2: Ch 2, dc in each st and ch-1 space around, working 3 dc in each corner; join. Round 3: Work a repeat of [sc in next st, skip 2 sts, 5 dc in next st, skip 2 sts] around blanket, working [sc, 5 dc, sc) in the 3 sts of each corner; join and break yarn. Round 4: With accent Color of choice (Aqua shown), shallow bpsc in each st around; join and break yarn. Weave in ends. And that’s the Happiest Blanket Ever! It’s currently the star of my guest room, sure to make my next overnight guest feel a little cheerier and at home. 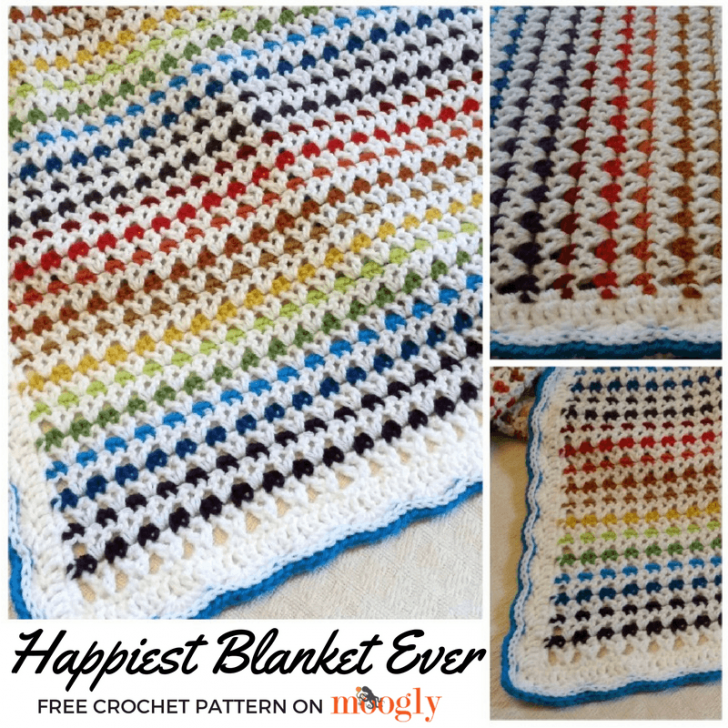 I can’t wait to see what colors you choose for your own Happiest Blanket Ever! 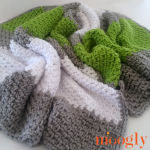 I hope you enjoy this free crochet blanket pattern! If I wanted to make it smaller, what is the multiples of? Thank you. Love the pattern! Thank you. Have a great day ! That is so beautiful, Tamara, I love that it can also be a stash buster. Thanks for sharing! Your creativity is very inspiring, functional, and unique! Thank you for your generous nature and skilled fingers! 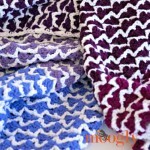 I’m getting ready to crochet the border. I’m nervous about all the colored ends showing through the border. Any tips for managing the ends? Hi Leslie! A little peeking through is normal, but you should be able to cover most of them with the border. The only real tip I have there is to push the ends to the back, if desired, as you crochet over them, to hide them further when possible. I’m doing the border and starting the 3rd row, do I skip 2 sts after the 5 dc in one stitch also or just after the sc. I hope that makes sense. Thank you. Hi Debbie! Whoops! Yes! Thank you for pointing that out, I’ll fix it now! Thank you and you’re welcome! ? Thanks for the pattern!! I’m working up an adjusted baby blanket size, and I’m getting daunted by the sheer number of ends I’ll need to weave in! Do you have any tips or tricks for that? I want my blanket to be really secure. My current best idea is to do a knit-on attached icord and tie a knot with each stripe’s end, letting it carry along the inside of the icord.. It is a lot of ends, it’s true. I just weave them in as I go, or save them for a Netflix night of crafty night with friends when I don’t want to have to concentrate! I don’t understand the very beginning. Are you skipping 5 chains or 4. I have finished the main part of the blanket and am distressed to find there is no video of how to do the edging. I know it should be simple enough, but I can’t figure out where to attach the single crochets on the sides of the blanket. Tamara, I know my eyes are OLD but…I am ASSuming..[yes, dangerous I know] even rows are the colored yarns? Is there any way to use one of the long color run stripeing yarns to run up the side[s] to avoid the loose ends? I need to get 3 new baby’s blankets done. Thank you so much for the pattern. 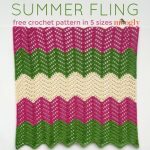 I have a lot of scraps that I could use to make this lovely blanket. Thanks again. Currently on the hook for the first of this year’s incoming babies. Caron Simply Soft in Off-White, Mint, and Strawberry. Thank you for another wonderful pattern! It’s so cheerful!